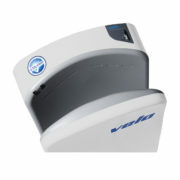 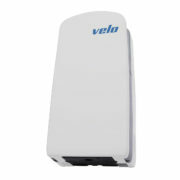 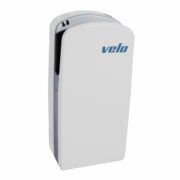 The Veltia Tri Blade Hand Dryer is even more advanced than it’s predecessor the Veltia. 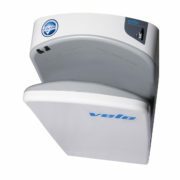 It’s super quick, hygienic and has low energy consumption. To keep Veltia New Generation Hand Dryers cleaner and fresher for longer our engineers have infused Microban® antimicrobial technology into the hand dryer during the manufacturing process to help prevent the growth of stains and odours caused by microbes. The Veltia New Generation Hand Dryer also incorporates the exclusive ZeroSmell in its unit that removes bad odours maintaining a fresh and pleasant environment. The new H12 Hepa Filter of Veltia Hand Dryer is positioned as one of the leading and most effective air cleaners on the market thanks to its high efficiency and effectiveness of its results that remove 99.95% of airborne pollutant particles. 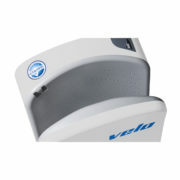 Operation: Three electronic high speed injected air lines. 2 motors with brushes: 30000 r.p.m. Protection rating against water projections: IPX1.